Cornelius Osborn was as much a chemist as he was a physician. This application of the word chemistry is not in the traditional sense. Osborn most likely did not perform and major experiments in his backyard or on the back porch of his small home on Osborn Hill. The amount of room he would have to perform some of the more sophisticated chemical tasks and experiment would have been lacking. Osborn was born much too late to know about Paracelsus or his immediate descendents as philosophers. The first direct connection any of the New World immigrants would have with an alchemist would be with a second or third generation descendent of the great Paracelsus, individuals who by then had pretty much modified and applied Paracelsus’s teachings to such an extent that they had numerous directions to be taken. The first following that grew as a derivative of the philosophy and metaphysics (psychology) of Paracelsus was a religious movement initiated by Jacob Boehme. Boehme took many of the philosophical makings definitive of Paracelsianism and redefined them using his own philosophy. Prior to this spiritual revival movement, Boehme was employed mostly as a cobbler, and his first popular writings made him somewhat of a social outcast, at least by the legal officials residing in the birthplace of his philosophy. Boehme’s second coming made its debut during the very early 1600s, peaking somewhere around 1615 to 1620, the dawn of the New World migration involving the United Netherlands. When Boehme taught his philosophy to those who would listen to and perhaps even abide by his teachings, they learned on the different psychological takes that could be produced with Paracelsian thinking. Paracelsus’s sulphur did not have to be the alchemical ingredient it was defined to be, it could instead be part of the make of the human spirit and spiritual “essence” (another term invented by Paracelsus). Just as the Orient had its Yin and Yang, a bit of Chinese philosophy that the Dutch were just beginning to learn to associate with, Paracelsus second element had its equivalent–the Sul and the Phur. The notion that even the smallest thing has its parts, and that the microcosm is very much depicted in the same way as the macrocosm, were two of the most popular teachings that Boehme had to offer his followers. In this way Boehme rewrote the alchemy of Paracelsus in just the right way, thereby facilitation the incorporation of part of an overall questionably God-like philosophy written over time by alchemists into something the common person could understand. By the 1640s, Boehme was known as the Teutonicus of his life’s era. The second direction Paracelsian influences travelled was deeper and deeper into the natural philosophy of science. With the passage of time, much of Paracelsianism was rewritten, retold, reconceived, and redefined according to what was then “modern tradition”. Like the modern science of today, this retelling was done to maintain the status quo by supporting the theory, redefining it and redescribing it in such a way so as to not really replace it with a new ideology. In the natural sciences for this time, Paracelsianism had to undergo change in order to remain volatile and reactive, as some Paracelsian followers might call this. The ways in which science however updated and redefined Paracelsus’s teachings was considerably more symptomatic than the Boehmites method of engaging in this type of social endeavor. Paracelsus’s teachings were no longer Paracelsianism once they underwent these changes, and Paracelsus’s alchemy was no longer alchemy. Instead, alchemy had become numerous sublimations of itself. In the New World, this alchemy was redefined in the middle 1600s as Christian Alchemy, with God’s choice, signs and purpose as the reasons it was initiated by George Starkey at Yale College. About the same time, Belgian physician and chemist Johanne Baptiste von Helmont redefined parts of it to meet his own needs for a better scientific philosophy of the metaphysics of life. Albrecht van Haller took an even less metaphysical and more physical, biological take on the powers that be according to Paracelsus. Throughout the 16th and 17th centuries, the terms, definitions, recipes and philosophies inherent to his alchemy underwent enough mutations to produce iatrochemistry (medical chemistry, or the chemistry of medicine) around 1650, and true chemistry by the end of that century. Along with the change in philosophical arguments, the names of the special mixtures changes as well. The most famous of these–the philosopher’s stone–would undergo the most change in application, use, purpose, philosophy and meaning as medicine itself evolved away from alchemical thinking and into the philosophy of medicine and how the body is built and works. We see this evolution of Paracelsianism reach its end during Dr. Osborn’s time and practicum years. During the wartime years of Osborn’s life, the recipes he would be exposed to were no longer as metaphysical as his own personal recipes were less than ten years earlier. By the end of the War, in Osborn’s mind, medicine had become a science, instead of an ever-changing series of metaphysical paradigms. The most that Osborn had of Paracelsianism in his home and recipes were the oven he probably owned for use in his semi-alchemical distillations and alembic precipitations, and several of the unique ancient drugs he decided to continue to make and use. It is safe to say that Osborn’s philosophy as a physician and surgeon was in line with one of the more popular thoughts regarding medicine at that time. Most historians refer to one of the more philosophical movements in science and medicine for the time was iatrochemistry, a term derived from ‘iatros’ referring to the practice of medicine or physicians (Gr iatrikos ~ iatros, physician) and ‘chemist’ from ‘chemic’ and ‘al-chemy’, in the inventor’s mind, iatrochemy one step up from the more primitive teachings known as ‘alchemy.’ The scientist to popularize the term iatrochemy was Johanne Baptiste von Helmont (1577-1644), a Belgian chemist and mystic whose first occupation was as a Capuchin friar and whose later natural philosophy undertaking in life was alchemy. Johanne Baptiste von Helmont was a follower of Paracelsianism. This form of alchemy as it was redefined by Jakob Boehme was designed to take on a more Christian-based sense to its teachings, through a reliance on trines–earth/metals, sulphur, and mercury–for many of its most alchemical claims. Helmont was also one of the first to heavily promote the use of gravity (a Newtonian energy) in inspecting solutions, such as for the evaluation of urine in order to help define a patient’s illness. According to Helmont’s philosophy, all physical objects have an internal ‘blas’ or spirit, sometimes referred to as the archaeus. The make-up of this archaeus was what defined its chemistry and vice versa. The chemical constituents responsible for the archaeus had their own product or agency of ferment known as “Gas.” It was this gas that Helmont felt defined the “sensory-motive soul” or anima sensitiva motivaque of an individual, the cause for one’s consciousness. Any gas-related chemical discovery involving the body could be related to the body’s physiology and cause for sickness in this portion of Helmont’s philosophy. Helmont’s philosophy had its parallels with certain parts of the humoural theory. These parallels enabled philosophers and scientists to relate the body’s chemicals and/or archaeus to the traditional Hippocrates four elements theory, in which Air was a possible equivalent to Helmont’s “Gas,” and the natural states of Helmont’s chemical ingredients an important part of the factor determining whether they were related to yellow bile, blue bile, blood or water, or whether they could be considered related to natural earth elements, or natural water elements. (Fire was pretty much restricted to fire itself and numerous other energy-based observations and philosophies.) Helmont’s “Gas” however was a more modern interpretation of what was becoming antiquated thinking. Helmont’s philosophy also assisted several more writers and scientists interested in alchemy, chemistry and medicine trying to become popular in upcoming years. All of these scientists, in some way, shape or form, had an impact on chemistry as Cornelius Osborn came to know it and practice it as a continuation of the Helmontian school’s practice of iatrochemistry. At this point in the review of Osborn’s writings, it is hard to determine how Helmontian the alchemical parts of his Iatrochemical practice were. 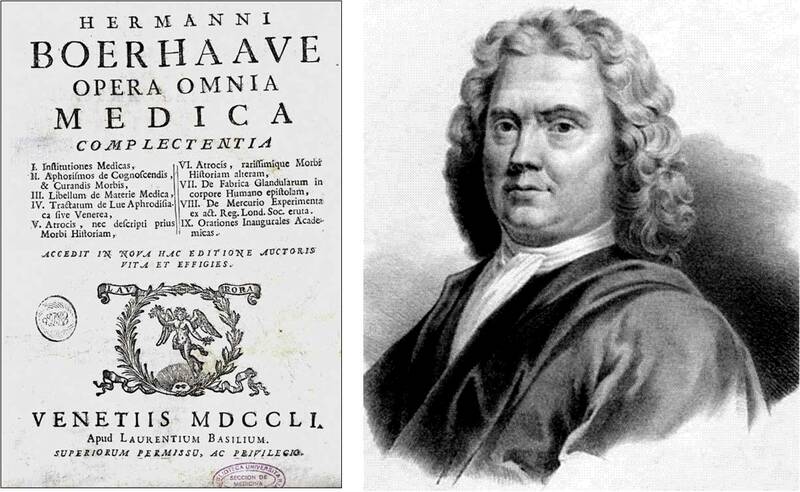 The next scientist to become a part of the evolution of iatrochemistry into a form practiced by Dutch (and English) physicians of the Colonial world was Hermann Boerhaave (1668-1738). Hermann Boerhaave developed his own school of medical thought, forming the “Eclectic School” of Leyden. His most important students at the time became highly important in later Colonial medical history related to the New Netherlands and New York. These students of his included Albrecht van Haller (1708-1777), William Cullen (1712-1790), Sir John Pringle (1707-1782), Gerard van Swieten (1700-1772) and Anton de Haen (1704-1776). The most influential of these students was no doubt William Cullen, whi is covered in a later part of this essay. In 1732, Hermann Boerhaave published his life’s work with the title Elementa chemiae (Leyden, 1732). This remained the most important chemistry books to many physicians for the next several decades. This may not have been Boerhaave’s most important contribution to Dr. Osborn’s philosophy and training, however. More than two decades earlier, in 1709, Boerhaave wrote one of his most important books for Dutch medicine, Aphorismi (Leyden, 1709). This led many Dutch followers to immediate christen Boerhaave as a Batavian equivalent of Hippocrates, the Father of Medicine. Boerhaave also managed to edit and republish a number of classics in medicine which prior to this were mostly in Latin. Most of these classics were a century old at the time they were published, if not older, and represented a basis for one of the periods of “enlightenment” both physicians and the common worker would experience during the Colonial years. Boerhaave’s reprints included an infamous book on human anatomical drawings produced by Andreas Vesalius, in which the organs and tissues were depicted on people often engaging in normal day-to-day activities. Boerhaave’s next contribution to the public and the medical professions was hsi decision to publish Botanicon Parisiense (1727), the life work of his dying colleague Sebastian Valliant. As a chemist, Boerhaave was able to define the notion of “affinity” of chemical substances with his work. He used this philosophy to explain the ability of different substances to interact with each other within a natural setting, which used mostly the theoretical “chemistry” of this site to define the affinitive and opposing relationships. He applied this thinking to his interpretation of the body in general along with its different parts, solids, liquids, and effluences. Boerhaave probably also distinguished the different parts and systems of the body based on such physical features as their solid, liquid and gas components, but by the end of his life he tended to focus upon the make up of the “fiber” of the body, as he referred to the “Solids”, and how this material holds together the body, its organs and its various other functioning parts. For the diseases of the “Solids,” he focused on such things as “the most simple and solid Fibre” in order to define a cure, and the ability to treat such things as a “lax or weak fibre”, “the stiff and elastick Fibre,” distempers of the blood vessels caused by their fibre, “weak and lax Entrails” caused by the breakdown of a “Cohesion of the Parts,” and “too strong and stiff Entrails” impacting the motion and circulation of the Blood throughout the blood vessels. With regard to the four basic humours–water, blood, black bile and yellow bile–Boerhaave noted the most important cause for disease to be the production of an “acid Humour”, which created havoc with the natural functions related to bloodflow, thereby creating circulation defects, resulting in a corruption of the blood, and in turn leading chemical changes and the formation of bodies or globules that float the blood impacting bloodflow (these globules may have in fact been his interpretation fo the blood cells under a microscope). This acidic humour Boerhaave believe could be related closely to the types of foods and drinks we consume, and how they are dealt with within the intestinal tract and types of “acid Acrimony” they create during the storage and preparation processes before consumption. A related cause for food and liquid related illness brought on by “acid Humour” was the effect of the physiology of the body itself upon the foodstuffs, focusing on the generation of heat following consumption due to the “fermentation” processes he believed the body engaged in with foods. Boerhaave also acknowledged that there was a “medullary Oil” in the center of most bones, and that this substance had something to do with the activity of its “Vesicles” (Joint spaces) and any nearby vessels, and through changes in “Heat and Vital Motion” results in diseases within these structures. He blames inflammation on the build up of fluids in the inflamed tissue, a process known as imposthumation “manifest[ed] from the Signs of a Suppuration lying deep under the Surface.” This “impostumes” condition in turn had an ability either to resolve, or to become gangrenous, require surgery, and/or cause death. Based on the content of his Aphorisms, Boerhaave’s knowledge of the Nervous system most likely came from a significant amount of experience he had with the wounded, probably due to the recent history of local wars between the Dutch and Spanish. Boerhaave is in fact most famous for a particular formula he devised, of an alchemical or iatrochemical nature, which he developed for the treatment of specific medical problems experienced due to physical injury. Boerhaave also discussed the nervous system and tis related anatomical parts and functions as a part of his various other disease reviews, inferring his familiarity with the application of his knowledge on the anatomy of the nervous system and its relationship with the unique functions of various parts of the body not directly in contact with this system. This latter feature remains an important part of his various physiological/philosophical lines of reasoning. 563. In every Fever, produced by an internal Cause, there are to be observed at some Time, and in some Degree, a Shivering, a quick Pulse, and a Heat. . . .
570. . . .there is only the quick Pulse, which is always present from the Beginning to the End; so that the Physician may from that Phaenomenon alone, when present, conclude there is a Fever. 572. . . .the proximate or nearest Cause of this Quickness [of the Pulse] is also the nearest Cause of a Fever hereby discovered. 574. Consequently, a too quick, reciprocal Influx of the nervous Juice, and that of the Cerebellum into the Muscles and Ventricles of the Heart. 575. Almost every Fever, that has hitherto been taken notice of, and proceeded from an internal Cause, begins first with the sense of Coldness, Shaking, Shivering, greater or less, longer of shorter, inwardly and outwardly apparent, according to the different Temper of the Patient, or the various Cause of the Fever itself. 576. At which time the Pulse is quick, small, and often intermitting; the Extremities are often pale, cold, stiff, trembling, and void of Feeling. 577. Whence it appears, that then the bloody Humours do stagnate at the Ends of the capillary Vessels, and there is not withstanding at the same time some Cause, that irritates the Heart. 578. Whence the cause of all the then present Phaenomena is understood. 579. In all Fevers, after the Symptoms of (575, 576), there ariseth a Heat, which is greater or less, or a long or short Duration, internal or external, generally all over the Body, or particular in some Part, according to the Variety and Differences of Fevers. In essence, the fever could be the result of numerous changes in personal hygiene, behavior, psychological and physical or physiological practices. The fever could be the result of an emotional outburst, a change in the body produced due to dietary changes, a result of environmental stressors such as long periods of rain or snow, significantly lower temperatures, significant changes in barometric pressure, could also result in a fever onset. Boerhaave was so certain about this that he even applied some of this reasoning to his brief discussions about the past Plagues, quoting many other experts on the plague published decades to centuries before. In later sections of his Aphorisms regarding the various types of fevers, Boerhaave discusses the intermittent fevers followed by a section covering those which Boerhaave refers to as the Phrensies and Osborn as the Agues. These are fevers which display two to seven day cycles in their various symptoms and body temperature changes, and are most representative of the fever related to the malaria epidemics that early colonists often had to endure due to its passage to European settlements, at home or abroad, by way of the international shipping routes. Peter Shaw. It is probable that many of Boerhaave’s writings became available to Dutch and English practitioners of the New World through the efforts of the highly-skilled Latin translator Peter Shaw (1694-1764). Shaw is directly mentioned by Osborn on at least two occasions in his vade mecum. the first is in his introduction or preface to this work where he wrote: “if you would look into Disorders and their Nature you must look to your Authors as HBoorH James Shaw or Sidenham or such Like.” Osborn refers to Shaw again on the 28th page of his manuscript as a part of his discussion of “Drapsie” (Dropsy), in which he wrote: “if you must come to Tapping Should refer you to Sharp Turner or Shaw.” This infers that the tapping he refers to is a surgical process, not a simple bloodletting process. The Dr. Sharp that Osborn is referring to is Samuel Sharp, a surgeon who published a timely book that was popular within the New York Colonial setting, and Daniel Turner, an English physician and famed Yale graduate during Osborn’s childhood years who wrote an important textbook on the Art of Surgery that later became highly valued by British Royalty. Whether or not Shaw’s writings served any additional role in Osborn’s readings of medicine is uncertain, but are important to note due to Boerhaave’s importance to Dutch culture. In 1724, Boerhaave’s Institutions et experimentae chemiae was translated by Shaw and published Chamber, and retitled The New Chemistry (London, 1724). This publication even led Boerhaave himself to update his book on the topic and thus the production of Elementa Chemiae designed for use by students. The amount of impact Boerhaave had on American mid- to late colonial Medicine is inferred primarily by his impacts on the local philosophies of medical practice that tended to remain important to the social settings in spite of attempts made to replace them with more physical interpretations of disease and illness. Dutch society in the New World favored the metaphysics of healing much more than the early British settlements that arose following the change of New Netherlands to New York during late 1600s. It is possible that this Dutch influence was supported and promoted even further locally within the formerly Dutch colonial towns and villages due to the increased public awareness Shaw’s works would have resulted in within the mixed Dutch-English settings of the Hudson Valley. This helped set the stage for the next changes to happen, due several modifications made in the old Dutch alchemy of diseases like fever first defined and promoted by Johanne Baptiste von Helmont and Hermann Boerhaave. George Ernst Stahl. During the 1730s, George Ernst Stahl (1600-1734) had a considerable impact on the alternative to iatrochemistry, iatrophysics or iatromechanics. Iatromechanics, as I will call it for the moment, was the most popular countermovement to iatrochemistry. This philosophy was pretty much based on the popular writings of Rene Descartes, whose most important historical writings helped to separate the operation of the body as a physical object from those operations which were then perceived to be spiritual and energy- or even soul-based. As a part of Descartes attempts to separate the physics of the body from its metaphysics, physicians following Descartian philosophy liked to view the body as if it were a highly controlled, well-regulated machine, expressing itself simply by way of various physics and mechanical mechanisms which were defined by Nature. To many physicians, this negated important parts of the vital energy or force philosophy that effected much of medical thinking at the time. This statement against the metaphysical interpretation of the vital energy seemed inadequate to many practitioners in the 18th century. In Europe and within the Hudson valley, this meant that physicians would have to make a choice during this period of philosophical transition from Helmont and Boerhaave, to either Stahlism, Hallerism, Brunonianism, or Cullenism. Central to the ideology of the work of Stahl of Ansbach, Bavaria, was his rewriting of Helmont’s teachings on the “sensitive soul” (the source for vital energy-based activities) in 1737. The philosophical entity which Stahl referred to was akin to the term “animism” (I say ‘akin to’ because, while referring to the anima in reference to this, “animism” is not necessarily Stahl’s term for this concept.) In one of Stahl’s last writings, this culmination of his work in medicine and natural philosophy gave way for the merging of Descartian thinking with Helmontian thinking by allowing for the soul and life force to be the energy source (the vital principle) required for a mechanical body to become a life form. Such a philosophy enabled physicians to view disease as either a somatic (physical, body) entity or a spiritual or soul entity. This also meant that the treatments for each could essentially make use of different protocols, and for the iatrochemist, different chemical formulas of either physical or metaphysical origin. This philosophy also enabled several new notions to surface regarding the flow of the vital energy in the body, in turn becoming a part of the philosophical basis for certain disease claims. For this reason, during Stahlian periods in medical history, the misguidance and misdirection of the soul itself could be as much a cause for a malady as the mechanical misuse or misapplication of the body in the physical world. For certain diseases, the reasons for sickness could be interpreted as being mostly of soul or spiritual origin, or due to personal and environmental factors. Like many periods in medical history when the philosophy of science or physics is up against the metaphysics of medicine, at least two distinctly different groups of healers form and two different types of medical practice develop. Whereas to some the physical world was mostly the cause for illness, in the other part of this profession there were those who practiced freely both forms of medicine. Most like, Osborn was one such type of these practitioners during the mid to late 18th century. During the 1730s and 1740s, and most likely peaking about the time of Osborn’s apprenticeship years, Stahl’s animist philosophy was able to give rise to the birth of the study of psychology in human thinking and the mind-spirit effects that can impact particular types of disease development processes. Such a philosophical argument or change would have enabled the various physical causes for disease to either be ignored from time to time, and/or later be related to some sort of mind-spirit philosophy enabling that particular form of manufacturing your medicine to become popular, if not commonplace. Osborn’s work very much reflects this transition in medicine taking place between the early and late 1700s. Osborn’s practice made use of some combined form of the various physical and metaphysical ways for practicing medicine then popular at the time in American colonial history. Osborn was both a chemist as well as an alchemist–an iatrochemist–and a physician as well as a metaphysician. With the use of arguments related to the irritability of the body in relation to disease development and the underlying role that many scientists believed “nerve energy” or force could play in this process, a belief in the practice of iatrochemistry and Stahl’s teachings would be most important to becoming a physician from about 1735 to 1745. Although Stahl’s writings may have not been introduced to Osborn right away, the knowledge of Stahl’s philosophy was no doubt spread just like other teachings and philosophies of medicine. It then became simply the option of Osborn to decide just how much this would impact the older teachings of famous Dutch medical writers as Boerhaave and Helmont. Hoffman. During Osborn’s childhood and apprenticeship years, there was also an argument about whether the body was directed by “animal spirits” or had a “nerve force” responsible for its activities. The animal spirits philosophy had a fairly Galenic, archaeic root to its philosophy (no alchemical pun intended with the word archaeic), which was linked to such things as Helmont’s “blas”, archaeus or ‘gas’ of the body and Stahl’s interpretation of the anima or animus. The notion that a nervous energy may be regulating part or all of the body’s functions became popular due to Fredrich Hoffman’s (1660-1742) rewrite of certain parts of the Aesclepian philosophy, imply certain parts of these statements about “spirits” were related directly to the nerves and their physiological activities. Hoffman felt that these activities were better represented and could be better understood if they were described as some sort of ethereal fluid substance flowing throughout the body, by way of the nervous system. This was used to reason out how and why the body could maintain its rigor within the musculature, thereby holding the arm up and keeping the back straight and the body as a whole erect while standing on two legs. It was also used to reason out the differences between acute diseases versus chronic diseases: the acute disease was the result of spasms within this mechanical system; chronic diseases due to atrophy or the inability to retain its position and strength due to the loss of nervous fluids. Hoffman became a fairly distinguished well-known writer of his theories on disease and medicine, with at least two dozen distinctly different treatises on different diseases written and published between 1682 and 1741. He began his published work with a treatise on the cause for metal-induced disease 1695, followed by an account of the associations and differences between convulsive asthma and dropsy in 17o7, and descriptive details on appendicitis in 1716. In 1716, Hoffman wrote an important philosophical discussion about the transmutation of diseases from one form to the next. About this same time he produced a 9 volumes series on disease and hygiene, published in sections between 1715 and 1728. in 1730 Hoffman produced an essay providing reasons for a “painful heart” , followed by another on the relationships between senility and disease in 1731. Aside from his works on dropsy (1707) and appendicitis (1716), Hoffman was the first to describe in detail the nature of chlorosis (1730) and rubella (1740). Due to his religious upbringings and his take on the natural philosophy of disease and medicine, medical historians like Garrison refer to Hoffman as the first Aesclepiadean Methodist of medicine. (see Garrison’s History of Medicine, any edition, p. 314), a unique title defining the predisposed nature of Hoffman philosophy which required the ability for its learners to be able to join the idolatry and ceremonial worship processes of treating the patient and the individual disease type (using objects, emblems, etc. to define a particular part of the body afflicted to help with the healing process), with certain parts of the alchemical thinking process (defining a specific recipe, however complex, for a specific disease cause or disease type and pattern). Of Methodist origin, this means for practice was no doubt both natural philosophy- and natural theology-based (a reminder of the same Christian alchemy philosophy promoted by George Starkey). Haller. Albrecht von Haller (1708-1777) of Bern, Switzerland and a student of Hermann Boerhaave, was the most interdisciplinary-trained scientist, physician and professor for his time. By the age of 16 he had written his first treatise on the physiology of the lingual vein as a blood vessel and not a duct like his mentor/professor contended. According to Garrison (ibid, p. 317-8), Haller became employed by the University in Gottingen as a professor in medicine, where he managed the local botanical garden, and wrote more than 10,000 scientific papers over the next 17 years. In his sizeable and most impressive of writings, Icones anatomicae (1743-1756), his anatomical illustration skills set the stage for how future books on anatomy and physiology would look. Haller used his lab setting to serve as a place of experiment on human tissues and organs, where he evaluated muscular and nervous tissue to document whether or not the activities of the two could be directly related. During this period of experimentation, the most popular hypothesis about muscular motion was referred to as the irritability theory. Defined formally by Francis Glisson (1597-1677, b. 1597 Rampisham, Dorsetshire, 1650s and 1660s-prof. Cambridge and Regius Universities) around 1677 in his De rachitude sive morbo puerili qui vulgo the rickets dicitur, tractatus (London 1650), the “irritability theory” stated that human tissues possessed a specific type of “irritability” which in turn once it was expressed resulted in a particular type of disease. This reactivity Glisson claimed was due entirely to the metaphysical make-up of the tissue or organ affected, and was pretty much dependent upon the vital spirits controlling how the body and its parts live and function. Whereas Glisson’s interpretation of the irritability was as a vital spirits phenomenon, Haller’s re-expression of this thought redefined it as a property of the tissues alone, not the energy or force found throughout the total body. Haller proves his claim by removing the muscle and nerve from rest of the body, and demonstrating the ability for each to cause a contraction of the muscle, without the need to include the other parts of the body’s as part of the energy process. this meant that the definition and the role of the vital energy philosophy was about to take a major term when it came to the rational, scientific thinking of the doctor. When Haller removed the nerve from the muscle and demonstrated that the muscle had its own ability to contract on its own, the philosophical applications of this finding significantly changed, and are what led to the first development of a medical electricity movement in medicine during the early to mid 1700s. Through these experiments, Haller was also able to demonstrate that there was a relationship of the nerve to the body’s reaction to its environment and its “sensibility” to environmental features. This in turn became the basis for Haller claiming the likelihood of whatever parts of the body are connected to this nerve to react to these nerve-generated energies or forces, defined a tissue’s “irritability.” These experiments, involving 567 individual studies, took place from 1757 to 1766, the first results of which were not published until at least 1759, when Haller’s Elementa physiologae corporis humanae (Lausanne, 1759-1766) was published. Haller’s other contribution to medicine, more in tune with Osborn’s years of learning, include a treatise which solidified his arguments for his theory of motor-generated activities being distinct from those of the nervous system (1736). His works also included a study on the digestion of fats and the need for bile by the body to carry out this biological process (1736), and a study of the impacts of exposing the body’s inner parts to putrid matters (1740), one of several intellectual method use to scientifically validate the many causes for miasma and the related miasmatic theories for the generation of disease at this time. Brown. Hoffman’s interpretation of the Stahl’s animism as a nerve force based on the ether travelling through the nerves and nervous system was taken a significant step further by John Brown (1735-1788), a follower of the Asclepiadean Methodism philosophy promoted by Hoffman. This was in part his own philosophical undertaking, although its sharing with the public and its expression in writing would be better congealed, formed and ultimately argued by the teachings and writings of his associate, William Cullen (1710-1790). This Brunonian Theory as it came to be called, was popular from about 1775 to 1800, with its first major synopsis published in 1780 and called Elementia medicinae. Brunonianism was very much a late-coming addition to Osborn’s learning, and only by word of mouth and discussions between peers perhaps, and in itself may not be the best word to use to define Osborn’s method of thinking. The premises for brunonianism are important to note, and more than likely are very much the most important underlying parts of Osborn’s philosophy that we have to try to understand. Brown’s theory on the tissues were that they were “excitable”. To move the arm we have to somehow excite its muscle or add to the excitement contained within its nerve. This was quite different from the need to irritate a muscle to make it move as defined by Haller. Brown’s theory also had the effect of removing from one’s overall picture of how the body lives and functions the role of life itself in this process. Brown’s theory could be interpreted as a statement that requires extracorporeal or external stimuli exist in order for the body to be excited and made to move. With this philosophy, the disease is termed “sthenic” when it is of an exciting nature, meaning that there is an increase in this energy or phenomenon responsible for the excitement process, or the disease is “asthenic” in nature, which means it is due to the reduction or riddance of whatever energy sources were responsible for its activation and life processes. Diseases could be constitutional in nature and borne from within the body, or they could be extracorporeal in nature and a product of you surroundings. Between 1780 and 1790, Brown’s philosophy grew in popularity mostly in North America. Europeans’ interests in brunonianism were fairly limited during these decades, substituted instead by the works and teachings of such authors as Francois-Joseph-Victor Broussais (1772-1838), Rene-Theophile-Hyacinth Lannaec (1781-1826), Robert Willan (1757-1812), and Phillipe Pinel (1745-1826). The American physicians for this time included such important University doctors and teachers as John Conrad Otto (1774-1844, New Jersey-Pennsylvania), Elisha North (1771-1843, Vermont), James Jackson (1777-1868, Boston), John Kearsley Mitchell (1798-1858, Virginia-Pennsylvania), medical botanist Jacob Bigelow (1787-1879) and Daniel Drake (1785-1852), and the published New York and Hudson Valley physicians: John and Samuel Bard, John Jones (1729 – ? ), Hunting Sherrill, Shadrach Ricketson, Nicolas Romayne, William Hunter, Samuel Latham Mitchell, and Valentine Seaman. Countering Brunonianism was Brown’s advocate-turned-debator, William Cullen (1712-1790). In 1744, Dr. Cullen was very much an English physician and helped to establish the medical school at Glasgow, where he remained active as a professor along with his similar position at the Edinburgh medical school. As a physician with much of his heritage and fame a s a physician bound by Great Britain, at some point in his intellectual history Cullen decided to remain a true supporter of the philosophies of his peers and thusly refute the teachings and philosophy of brunonianism. 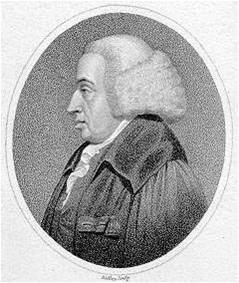 His additions to the schools of Medicine in Great Britain were the teaching of medicine in English rather than Latin around 1757, his proposal for the practice of a form of hydrotherapy using waters of varying and differing temperature ranges (1760), and his creation of a method for correlating and categorizing diseases which he published as Synopsis nosologiae methodicae (1769). From 1776 to 1794, his most popular work was First Lines in the Practice of Physic, in which he differentiated various forms of the same disorder, such as the 34 types of rheumatism and the numerous forms of neuroses and varieties of local diseases that may be generated solely to locally isolated predisposing disease-causing factors. If the works of Boerhaave, Stahl, Hoffman and Haller were the most influential 17th and 18th century medical scientists to influence the metaphysics and philosophy of New York, Hudson Valley and Dutchess County medicine, Cullen was the principle physician of European descent trying to influence the physical aspects of disease and medicine to be promoted. Cullen argues this exact notion in the preface to his work First Lines in the Practice of Physic, by William Cullen … with Practical and Explanatory Notes by John Rotheram MD (New York, 1805). By 1783, with the Revolutionary War over, this philosophy was now able to have a more lasting influence on the locals in the Hudson Valley and Dutchess County settings. When reviewing the recipes and writings for the time, there are two schools of thought to keep in mind with the local physicians. The first is that some are going to be “British Loyalists” only in the medical philosophy sense. 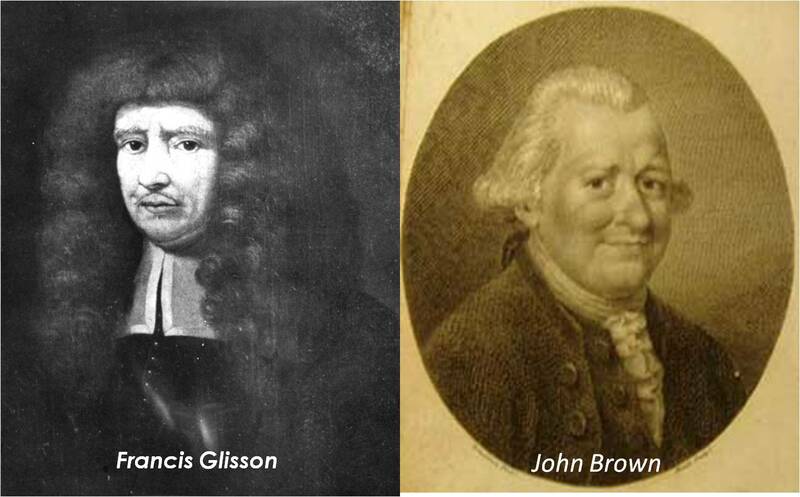 These are the survivors of change in medicine who continue to support the “nervous energy” philosophy of the body and disease as it is described by William Cullen. Then there are the brunonians, those who favor the notion that disease is due to the excitation of the body and the subsequent cause of “sthenic” or “asthenic” disease types. Somewhere between the design of humoral and miasmatic theory of ancient times, and the invention of Brunonian- and Cullen-thinking of the late 18th into 19th century, was the development of a philosophy of disease that was very much dependent on the various forms of energy within the body. This energy is used to provide reasons and methods as to why and how these diseases develop. When these energies become amiss and absent, versus the other methods by which these energies express themselves, disease sets in. We can deduce which of these philosophies Osborn adhered to by searching for the key words he uses to express his methods of healing. Most of this analysis will be found later in the “Commentaries and Aphorisms” section once I develop a more complex understanding of this philosophy. Somewhere in Osborn’s mind and thinking process, the notions of metaphysics and physical medicine are blended together, in a very localized philosophical sense. Osborn’s thinking demonstrates possible connections to the new alchemy or iatrochemistry define by Helmont during the mid to late 1600s, followed by the perpetuation of Boerhaave’s teachings. His writings also demonstrate to us some influences of the philosophy of irritability as taught by Haller, and a personal conversion Osborn produces of Stahl’s work on the animus/anima, introduced to the early 18th century colonies of Connecticut and New York by publisher Shaw. There is one medical philosophy not reviewed on this page that could be what Osborn was adhering to in terms of the metaphysical parts–Theophilus Borden’s Vitalism theory, which was popular 1740-1760. This would have been the new discovery in medicine at the time Osborn was learning his skills. Still, Osborn makes reference to other writers, who expressed other philosophies. Since many of the references are to a period 2o years earlier, it is likely someone local, perhaps 20 years or more older than Cornelius, taught him the basics and had these books for Osborn to read. But Osborn is read in some of the Boerhaavian-Borden philosophy. This means that a good question to find the answer to is: What were the popular Vitalism books for the times? The previous associations alone help to pull together Osborn’s philosophy about what is the cause for disease. Unfortunately, Osborn’s thinking is just not this simple. Of multicultural origination, and perhaps raised very much with some anti-Cullenism expressed by some of his most loyal non-Anglican comrades, we can expect Osborn to somehow different, which he is. Osborn’s formulas seem a little more archaic than expected, and the metaphysical nature of one of his practices tells us he was educated in the alternative thinking of earlier Dutch societies as well. Due to this we also see and can argue that there are the influences he had produced by two other local scholars for the time, worth of review. 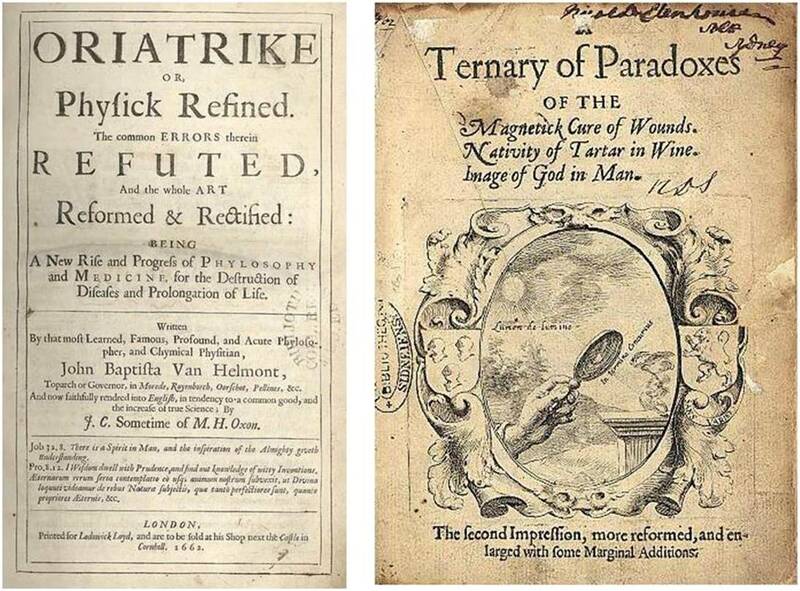 George Starkey was a Bermuda-born Christian Alchemist of the mid to late 17th century who was schooled at Harvard University, and then made his way to England where he conversed with several other important alchemists for the time, including Robert Boyle. Starkey was also in close contact with the Governor of Connecticut at the time, John Winthrop, Jr.
Osborn was also influenced by licensed physician and later Yale honorarium MD Daniel Turner, who spent most of his life in England. Turner would provide Osborn with a philosophy of disease, in particular some background training on the feminine energy, his definition of the semeni or “seed” of a disease, and his philosophy as to how to best treat the most difficult type of “diseases” to diagnose–the fever. In 1768, ranging from 20 to 40 years after Turner’s most important writings were published, Osborn mentions Turner as an important influence. These two scholars, Starkey and Turner, are opposites, and are not reviewed here because their influences on colonial medicine, in particular Osborn’s practice and teachings, probably have to be reviewed separately. The same is true for the popular metaphysicist for this time, Theophilus Borden. Since most of the reasoning on this page came about years before, I have tried not to bias my argument by stating how strongly Borden’s Vitalism theory probably played a role here as well. The issue of Cullen versus Brown is the major topic for this time in the medical world, especially for Revolutionary War physicians (a true patriot had better side with Cullen). The coverage of Borden’s philosophy is therefore saved for another time. These influences of the above philosophies and teachings, in combination with the nature of Osborn’s methods of preparing his recipes, suggests he believed he was practicing some sort of modern alchemy, which in his mindset might have been terms iatrochemistry were he familiar with this Helmontian term. Osborn retains some non-iatrochemical notions in his references to past authors as well, primarily the clinical, bedside manner of treating the patient so heavily promoted by Sydenham in his essays on medicine, and to some extent inferred by his knowledge of parts of the philosophy promoted by Dutch-bred “Batavian Hippocrates” physician and professor, Hermann Boerhaave. His adherence to Starkey’s philosophy, perhaps as a result of Borden’s revival of vitalism, seems to best fit Osborn’s iatrochemical way of thinking. Physicians like Osborn who were also skilled chemists are very unusual. The tendency was for a doctor to mimic Thomas Sydenham and therefore Hippocrates if he was not going to mimic the philosophy and practices of the most popular writer for the time–which in this case was William Cullen, a solidist, not a metaphysicist. To Sydenham, the patient comes first. Observations, not adhering to your text books, was the best way to observe and treat a patient. This meant you paid close attention to the patient from the skin out (I discuss the meaning of this more under my review of Daniel Turner), rather than from the skin in through the anatomy and physiology of the flesh and solid and hollow organs. Osborn visualized the flow of energy in someone when trying to conceptualize his/her illness. This Bordenian philosophy also provides us with a little more insight into how Osborn made contact with the patient to learn about his or her physical and metaphysical state. Osborn felt the pulse of a patient on both wrists at two levels, a practice akin to Oriental pulse therapy. The Dutch are the first Western Europeans to appreciate Oriental metaphysical philosophy. During the 1660s they interpreted the Chinese concept of “qi” or “chi” as fire and used this to accept and explain why pulse therapy, acupuncture and moxibustion could be practiced. Now, nearly a century later, Borden and Boerhaave’s philosophies enabled this to happen again within the clinical setting. According to Osborn, one had to understand the pulse as an expression of the patients vital state, that same substance used to make up the philosopher’s stone according to 1849 Harvard chemist George Starkey. As an iatrochemist, Osborn would have called this energy ens or entia, a paracelsian name. Recipe for Consumption: put all to gether in a botil / or flask and Let it in Corperate in the heat / of the Sun or in a Gentel Sandheat Shaking / well 2 Times a Day and after 3 or 4 Days– / Let it Setel and Then Decant in a nother botil /for use. Turlington’s Balsam for Life: put all to gether in / a flask and Stop Tite and set in the Sun / Every night Take it in and in the Day Set / it in the Sun again and in 10 Days it is / fit for use.